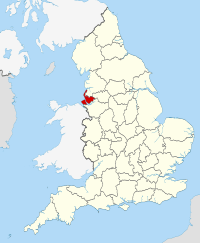 Merseyside (/ˈmɜːrzisaɪd/) is a metropolitan county in North West England, with a population of 1.38 million. 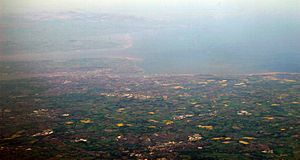 It encompasses the metropolitan area centred on both banks of the lower reaches of the Mersey Estuary, and comprises five metropolitan boroughs: Knowsley, St. Helens, Sefton, Wirral, and the city of Liverpool. Merseyside, which was created on 1 April 1974 as a result of the Local Government Act 1972, takes its name from the River Mersey. Merseyside spans 249 square miles (645 km2) of land which border Lancashire (to the north-east), Greater Manchester (to the east), Cheshire (to the south and south-west) and the Irish Sea to the west. North Wales is across the Dee Estuary. There is a mix of high density urban areas, suburbs, semi-rural and rural locations in Merseyside, but overwhelmingly the land use is urban. It has a focused central business district, formed by Liverpool City Centre, but Merseyside is also a polycentric county with five metropolitan districts, each of which has at least one major town centre and outlying suburbs. The Liverpool Urban Area is the fifth most populous conurbation in England, and dominates the geographic centre of the county, while the smaller Birkenhead Urban Area dominates the Wirral Peninsula in the south. For the 12 years following 1974 the county had a two-tier system of local government; district councils shared power with the Merseyside County Council. The county council was abolished in 1986, and so its districts (the metropolitan boroughs) are now effectively unitary authority areas. However, the metropolitan county continues to exist in law and as a geographic frame of reference, and several county-wide services are co-ordinated by authorities and joint-boards, such as Merseytravel (for public transport), Merseyside Fire and Rescue Service and the Merseyside Police (for law-enforcement); as a ceremonial county, Merseyside has a Lord Lieutenant and a High Sheriff. Merseyside is joined by the neighbouring borough of Halton to form the Liverpool City Region, which together forms a local enterprise partnership and combined authority area. Port of Liverpool docks, at Seaforth. Merseyside lies at the Mersey Estuary. Merseyside was designated as a "Special Review" area in the Local Government Act 1958, and the Local Government Commission for England started a review of this area in 1962, based around the core county boroughs of Liverpool/Bootle/Birkenhead/Wallasey. Further areas, including Widnes and Runcorn, were added to the Special Review Area by Order in 1965. Draft proposals were published in 1965, but the commission never completed its final proposals as it was abolished in 1966. Instead, a Royal Commission was set up to review English local government entirely, and its report (known as the Redcliffe-Maud Report) proposed a much wider Merseyside metropolitan area covering southwest Lancashire and northwest Cheshire, extending as far south as Chester and as far north as the River Ribble. This would have included four districts: Southport/Crosby, Liverpool/Bootle, St. Helens/Widnes and Wirral/Chester. In 1970 the Merseyside Passenger Transport Executive (which operates today under the Merseytravel brand) was set up, covering Liverpool, Sefton, Wirral and Knowsley, but excluding Southport and St. Helens. 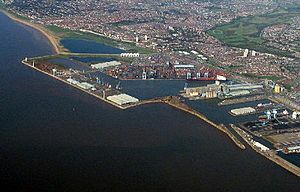 The Redcliffe-Maud Report was rejected by the incoming Conservative Party government, but the concept of a two-tier metropolitan area based on the Mersey area was retained. A White Paper was published in 1971. The Local Government Bill presented to Parliament involved a substantial trimming from the White Paper, excluding the northern and southern fringes of the area, excluding Chester, Ellesmere Port (and, unusually, including Southport, whose council had requested to be included). Further alterations took place in Parliament, with Skelmersdale being removed from the area, and a proposed district including St Helens and Huyton being subdivided into what are now the metropolitan boroughs of St. Helens and Knowsley. Merseyside was created on 1 April 1974 from areas previously parts of the administrative counties of Lancashire and Cheshire, along with the county boroughs of Birkenhead, Wallasey, Liverpool, Bootle, and St Helens. Following the creation of Merseyside, Merseytravel expanded to take in St Helens and Southport. Between 1974 and 1986 the county had a two-tier system of local government with the five boroughs sharing power with the Merseyside County Council. However, in 1986 the government of Margaret Thatcher abolished the county council along with all other metropolitan county councils, and so its boroughs are now effectively unitary authorities. 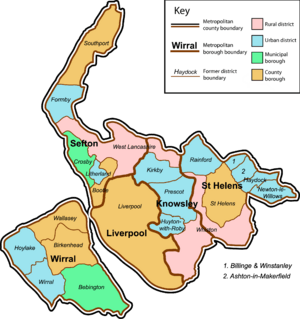 Merseyside is divided into two parts by the Mersey Estuary, the Wirral is located on the west side of the estuary, upon the Wirral Peninsula and the rest of the county is located on the east side of the estuary. The eastern part of Merseyside borders onto Lancashire to the north, Greater Manchester to the east, with both parts of the county bordering Cheshire to the south. 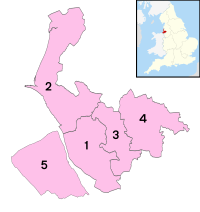 The territory comprising the county of Merseyside previously formed part of the administrative counties of Lancashire (east of the River Mersey) and Cheshire (west of the River Mersey). The two parts are linked by the two Mersey Tunnels, the Wirral Line of Merseyrail, and the Mersey Ferry. To express location within the Merseyside area by the preposition on – thus "on Merseyside" as opposed to "in Merseyside" – was traditionally the more usual. However, the logic of suggestions in support of this from some quarters (that, after all, one would always be "on" the side of the Mersey, not "in" it) falls down; since it is, in fact, entirely possible to be situated [both] "in" or "on" [either] “side” of the River Mersey and area(s) thus designated. Therefore, more recent usage tends to draw distinctions between the geographical "Merseyside" – for which "on" is considered appropriate – and the Metropolitan county of "Merseyside", for which "in" is used. Ipsos MORI polls in the boroughs of Sefton and Wirral in the 2000s showed that in general, residents of these boroughs identified slightly more strongly to Merseyside than to Lancashire or Cheshire respectively, but their affinity to Merseyside was more likely to be "fairly strong" than "very strong". Other nearby towns are not part of Merseyside, such as Skelmersdale, Ormskirk, Warrington, Runcorn, Widnes and Ellesmere Port (all parts of either Cheshire or Lancashire), but the designation "Greater Merseyside" has sometimes been adopted for Merseyside and these six towns unofficially. This also has a semi-official usage by some local authorities and organisations and is used by Geographers' A-Z Map Company for their Merseyside Street Atlas. However, a separate 'City region', comprising Merseyside and Halton, has some official recognition as being Greater Merseyside, although it has also been referred to as Liverpool City Region. Halton also forms part of the Merseyside NUTS region. Coat of arms of the Merseyside County Council. Merseyside Facts for Kids. Kiddle Encyclopedia.